Our website encourages the filing of an Uniform Commercial Code Financing Statement, otherwise called an "UCC Lien," to secure your bill with various forms of insurance not otherwise secured by the traditional Arizona medical lien we've filed for years. 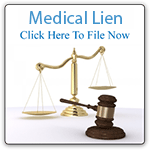 Once the lien is paid, the lien should be released within thirty(30) calendar days just like the Arizona medical lien but with a document called a UCC Amendment. Our website files , mails, and stores both the UCC lien and the UCC Amendment. A note of caution: a UCC lien only works if the patient agrees to give the medical creditor what's known as a "security interest" in the ongoing insurance claim, usually by agreeing to do so with the appropriate language in the patient's initial financing documents bearing the patient's signature. The wording of the security interest language must precisely describe the insurance interest , otherwise known as the "collateral," so please consult with your business attorney for help with the correct language to use.